The 2010 vintage didn’t have an easy start as numerous media already condemned it as a sour (white) wine vintage at a time when harvest wasn’t even fully brought in. 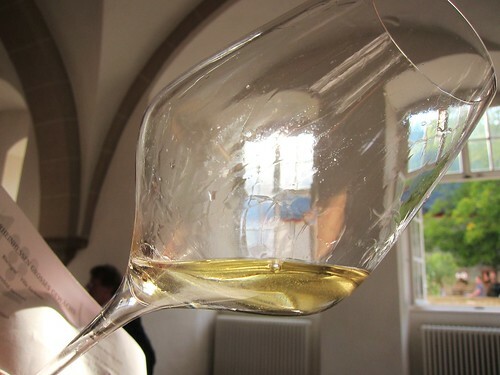 And it’s true that for many of the estate’s basic Rieslings, qualities are rather heterogenous. For the Great Growths however, I read more and more opinons that are highly praising this new vintage, even putting it above last year’s great success. As for myself, I was also positively surprised by the homogenous quality of 2010 GG. 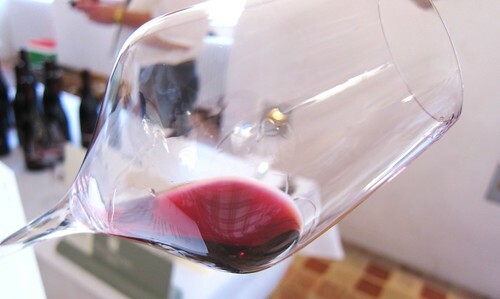 There are naturally always regions that under- and overperfom, as we are dealing with products that are influenced by regional weather conditions, but I guess as a whole there are more success-wines than in 2009. However it is of course also a matter of taste! 2010 somehow reminds many of 2008, with slimmer and fresher wines, with lively acidity and good minerality. Those who like voluminous fruit will probably still prefer 2009. For my palate, I found some stunning 2010 Riesling’s that I wouldn’t want to miss in my cellar. A “wild vintage” thus meant in the best sense you could interpret these 2 words with. But first of all, let’s mention the red Great Growth wines that were being presented, this time stemming from the 2009 vintage. Somehow I didn’t see too many diverging opinions here: 2009 was simply an excellent Pinot and red wine vintage in Germany. 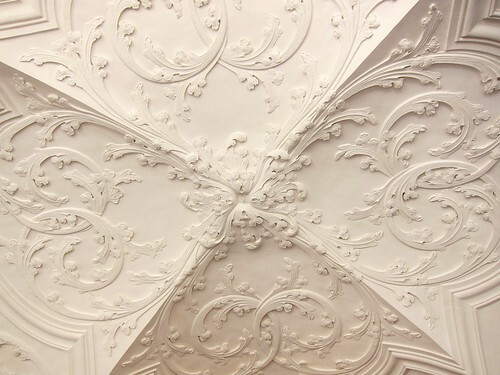 Big, voluminous, structured, but still charming and with fruit. There’s nothing to say against Becker’s Pinot from the very Southern tip of the Pfalz. The only problem might be the price, especially with the Sankt Paul. But what wonderful Pinots they are! Germany meets Burgundy. Bernhard Huber from Baden as usual presents 3 wonderful Pinots’. Bienenberg is very straightforward on fruit, with a basket of cherries. Schlossberg, and especially Sommerhalde are not without fruit but much more structured and needing lots of time in the cellar. 3 great successes! 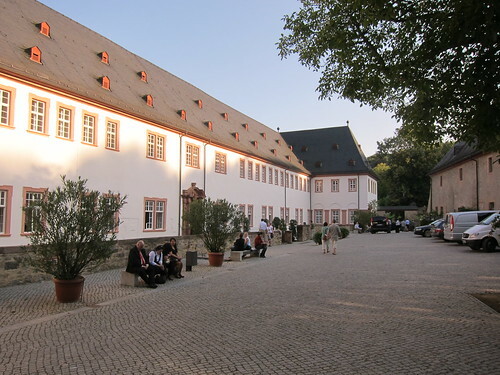 As the previously mentioned estates, Weingut Fürst is a must for every lover of Pinots. All 3 wines are worthy of being in your glass. 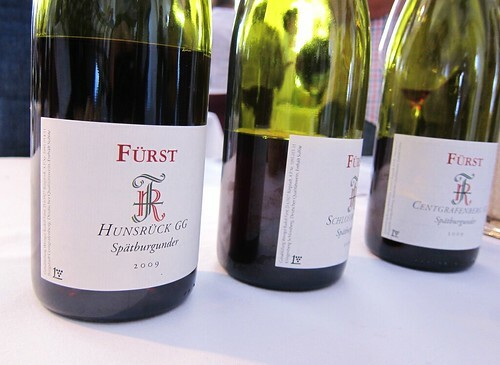 Centgrafenberg and Schlossberg are profound and well-structured, but especially Hunsrück is made to age. Very promising wines. 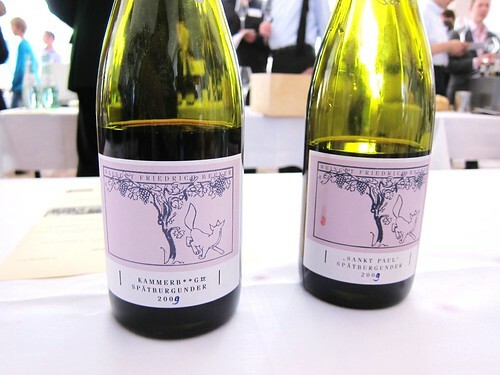 Rainer Schnaittmann‘s Pinot from the Fellbacher Lämmler vineyard shows good weight and seductive spice notes. 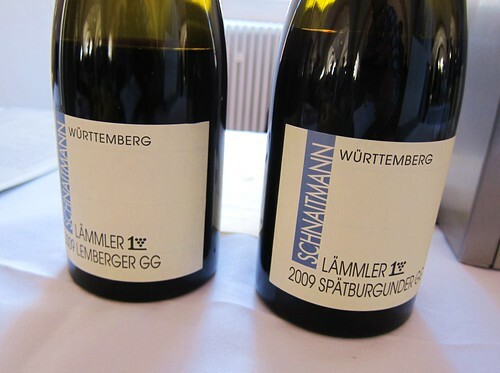 The Lemberger GG, from the same vineyard is even bigger, with power and spice, made to grow with time. 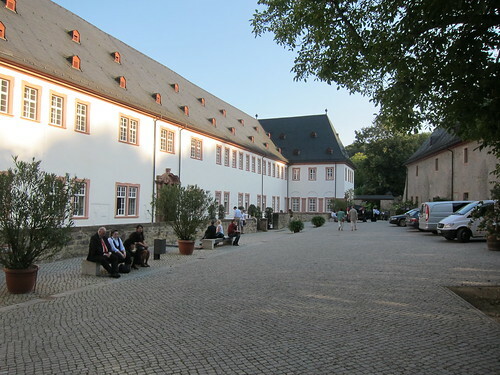 I should also mention the Pinot’s of Gutzler from Gundheim in Rheinhessen. Both Westhofener Brunnenhäuschen and Westhofener Morstein show nice weight and beautiful smoke notes, slightly reminding burned car tires, but in a good way. Unfortunately, I didn’t have time to taste the reds from Ahr and also left out quite a few more wines from Baden, Württemberg and Pfalz. Anyhow, as of what I heard, there isn’t really one bad wine from that vintage. Many say you can buy these blind. Then on with 2010 Rieslings. I was positively surprised with a few from Rheingau where I didn’t expect much after having tasted a lot of overly acidic basic wines. But First Growths are always a different affair. And I assume time will probably have helped their base wines as well. 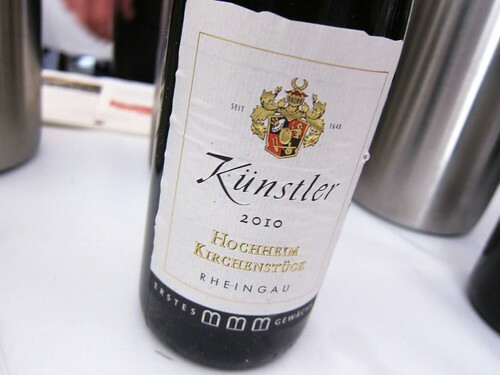 First real big surprise for me were the FGs of Künstler, one of the few wineries that didn’t deacidify for 2010. A tuff bet, but which worked out for these FG’s. Especially Hochheimer Kirchenstück was singing, with lots of warmth in front of a spicy and elegant acidity that seemed well integrated, all within a slim body. Kostheimer Weiss Erd was there as well. Only the famous Hochheimer Hölle still has some more time to go with acidity seeming a bit overpowering. I’m curious about professional comments here! 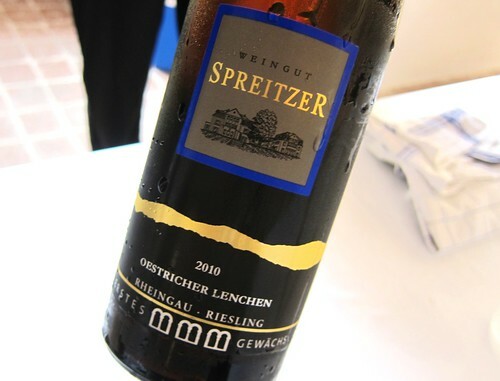 Both of Weingut Spreitzer‘s FG also were very convincing, in a lusher style than Künstler’s. Wisselbrunnen appears perfumed, with fruit and even a little on fruit sweetness, but still slim with a well integrated, rich acidity. Oestricher Lenchen played on the same cords but seemed a little rougher, even a tad tannic. Give it some more time. 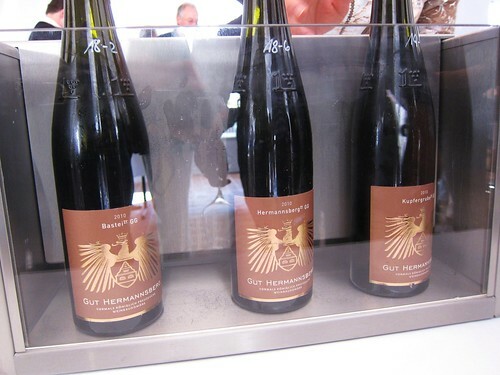 Robert Weil‘s Kiedricher Gräfenberg also found the right balance between fruit, minerality and acidity, potentially making it one of the most appealing specimen of recent years, and indicating great ageing potential. A clear buy? A slight disappointment for me maybe Schloss Johannisberg‘s Silberlack FG, seeming a bit flat after Künstler’s powerful, yet elegant acidity. There’s layers of fruit and minerals, but it seems to be lacking spritz. A shortt break here after the 2 big successes of 2008 and 2009? Then on to the Nahe. A killer-region again for 2010, seeming even better than in previous years. It’s getting very hard to pick favorites here… Which on the other hand also means, that it’s hard to pick a bad wine. That is very good news! Hermann Dönnhoff, who has always been displaying the classic bold Riesling fruit has a breathtaking Hermannshöhle on offer, more wild and racy than usual, a bit slimmer but seeming to have even more substance than ever. A long runner. Schlossgut Diel impressed me with a great Schlossberg: energy-loaded, compelling presence with fruit and minerality. Would love to try this one again. But again: from these wineries you could basically pick any Great Growth and you wont be disappointed! Maybe a tip for the more reasonable wallets (selling at about 29 € while many of the big names start at 35€): the GG by Gut Hermansberg, allways lean and wild, leaning towards acidity and loaded with minerals. I have a weakness for their Hermannsberg. Bastei and Kupfergrube both show a hint of vanilla, due to some new barrels introduced to the cellar. 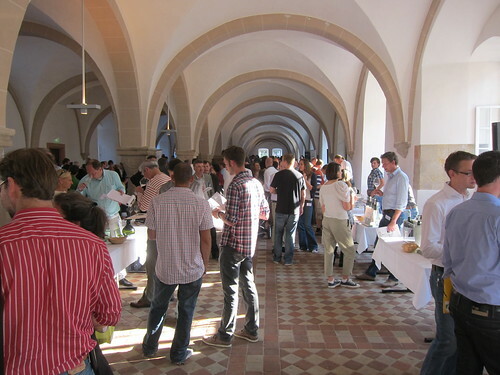 For the Pfalz region, the vintage seems to be a good success as well. More precisely I’d say that the higher acidities suit these wines which are usually on a bold and baroque fruit side very well . Let’s start with the big fish. Dr. Bürklin Wolf impressed me – never have I seen their wines so slim and racy. The vintage apparently brought a true change of style (even if it’s probably only for that year) which I think is really refreshing. First great example for me was Kalkofen: an acidic-aromatic bomb. But there’s hardly a bad wine in their program anyway. It goes on to the mighty Kirchenstück, a sleeping giant right now, with a great life ahead. A lot of good things have been written about Von Winning‘s wines already and I guess I can confirm it, even though the wines seem quite closed at the moment. Some are displaying the vanilla notes coming from newer barrels that were also there in past vintages. Spiess from Ruppertsberg was probably the most vivid wine right now, offering intense smoke notes and minerality, the others seem to be sleeping still. 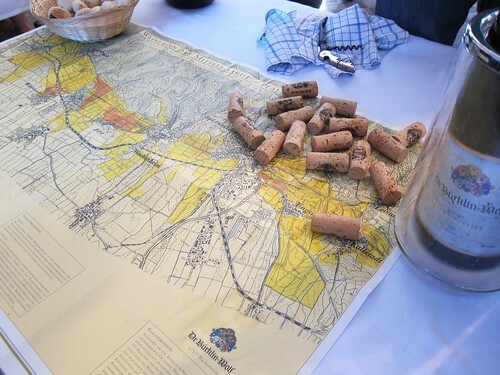 Otherwise there are too many wines to write about from this region. I’ll just mention a few but there are so many more excellent qualities to discover here. 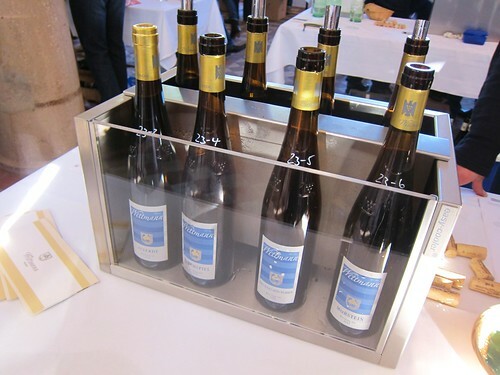 Müller-Catoir‘s Bürgergarten is a charming Riesling with a somewhat calmer and more floral appeal. 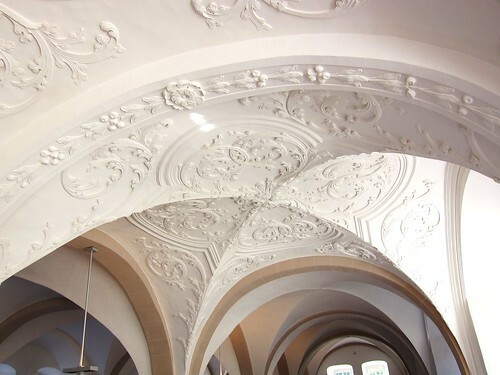 Christmann‘s Idig stunned me with loads of chalk – a mineral powerhouse. I also liked both Rieslings by red-wine specialist Knipser, especially Mandelpfad. 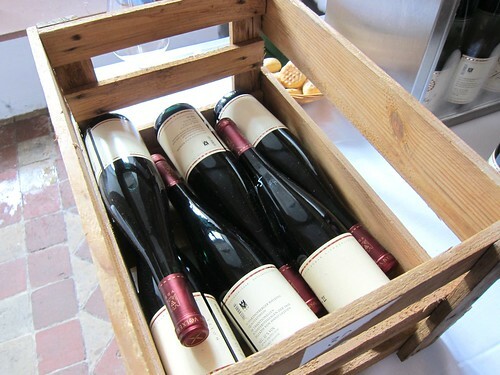 They both come along with the more classic Pfalz Riesling fruit appeal, but are wrapped with that nice 2010 acidity. While I already tipped my hat at all these great collections from the Nahe, I believe I have to bow in front of Philipp Wittmann‘s collection. All of his GG are exceptional wines! 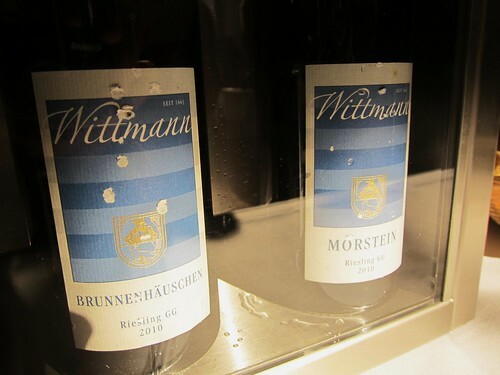 Brunnenhäuschen already is a stunning wine, energy- and mineral-loaded, a monolithic powerhouse. But it is even topped by a great Morstein. This is hard to explain, I think one has to simply taste these wines to understand how impressive they are. Wagner-Stempel showed 2 beautiful GG with completely different personalities. Heerkretz appears more on the acditiy and minerals side, a bit wild right now and needing a little time to get together. Höllberg, while also being loaded with minerals, is the more fruit-driven wine, already offering lots of drinking-pleasure now. Kühling-Gillot‘s Pettenthal from the Roter Hang vineyard is again a great ambassador of this site, showing fruit but also rather masculine notes of tobacco and herbs. 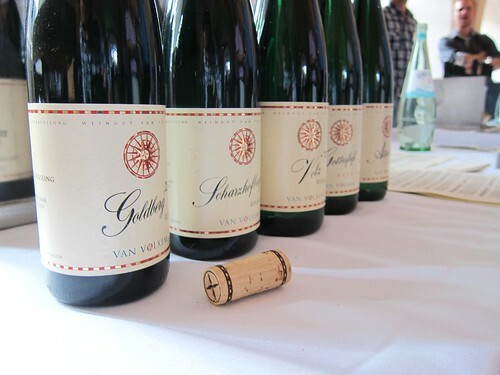 I didn’t tast much from the Saar, but truly loved the wines of Van Volxem. No notes taken, but I will definitely get back to these. 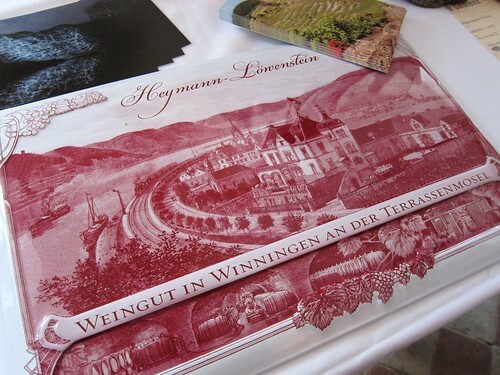 Same goes for Mosel where Heymann-Löwenstein presented some deep, breathtaking wines. I’ll keep these in mind for later.